An easy to install bathroom safety solution, the Vive toilet seat riser with removable handles securely attaches to any standard toilet seat providing 3.5" of added height. Great for those recovery for surgery or injury, the elderly and those with limited mobility the elevated toilet seat assists individuals when sitting or standing. Fitting under your existing toilet seat, the toilet seat riser adds 3.5" of height to the seat, making it easier to sit or stand without bending. A great bathroom safety solution for the elderly, those with limited mobility and those recovering from hip, knee or back surgery. Installing under any standard toilet seat, the toilet seat riser securely attaches with the included screws and washers without the use of tools. An interior lip on the bottom of the riser eliminates slipping for a safe and secure seat. Removable handles are padded with comfortably soft foam hand grips for additional assistance when sitting or standing. The handles provide a nonslip surface for a safe and secure grip. Easily removable if desired, the width between the handles is a generous 22". 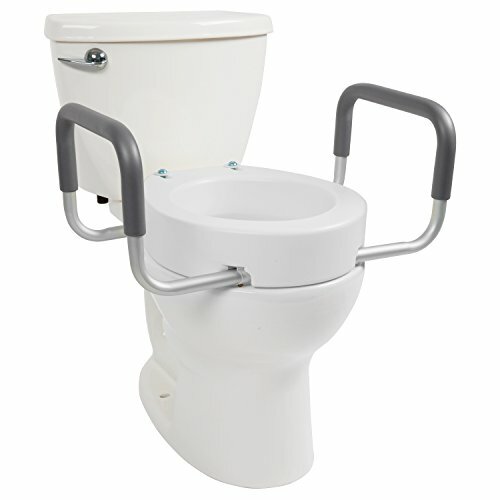 The durable composite toilet seat elevator supports up to 300 pounds and is split-resistant for extended usability. The seat riser can be wiped down with regular household disinfectants or sanitizing wipes. Made with corrosion resistant aluminum, the handles are also easily cleaned with traditional bathroom disinfectants. WHAT SIZE IS RIGHT FOR ME: Toilets typically come in two sizes, standard and elongated. We offer a size for either style, so make sure you know which toilet you are purchasing for before checking out. An elongated toilet is longer and from the back of the bowl to the front measures about 13", a standard toilet measures 11" back to front. ADDS 3.5" OF HEIGHT TO EXISTING STANDARD TOILET SEAT: Fitting under your existing toilet seat, the toilet seat riser adds 3.5" of height to the seat, making it easier to sit or stand without bending. A great bathroom safety solution for the elderly, those with limited mobility and those recovering from hip, knee or back surgery. TOOL-FREE INSTALLATION: Installing under any standard toilet seat, the toilet seat riser securely attaches with the included screws and washers without the use of tools. An interior lip on the bottom of the riser, coupled with slip resistant strips, eliminates slipping for a safe and secure seat. SOFT COMFORT GRIP HANDLES: Removable handles are padded with comfortably soft foam hand grips for additional assistance when sitting or standing. The handles provide a nonslip surface for a safe and secure grip. Easily removable if desired, the width between the handles is a generous 22". DURABLE COMPOSITE TOILET SEAT ELEVATOR: The durable composite toilet seat elevator supports up to 300 pounds and is split-resistant for extended usability. The seat riser can be wiped down with regular household disinfectants or sanitizing wipes. Made with corrosion resistant aluminum, the handles are also easily cleaned with traditional bathroom disinfectants.